Over the course of her long and adventurous life, Jessica Mitford was an investigative journalist, civil rights activist, vivid raconteur and champion of outsiders and underdogs. You find that her admirers and detractors use the same words to describe her: muckraker, subversive, mischief-maker, tease, and nuisance. In a series of literary exposés like The American Way of Death, The Trial of Dr. Spock (about conspiracy laws during the Vietnam era) and Kind and Usual Punishment (about the necessity of prison reform), Mitford fearlessly defied authority figures. It was a habit she’d cultivated reaching back to the 1930’s, when as the daughter of English aristocrats she had repudiated wealth and privilege to run away to the Spanish Civil War with Winston Churchill’s nephew, Esmond Romilly. The inscription on the Mitford family coat of arms was “God Careth for Us”, but embarrass the powerful, mock the hypocrite and shift the complacent were always mottos more to Decca’s taste. Leslie Brody’s memoir Red Star Sister was awarded the 1999 PEN Center USA West prize for Creative Nonfiction. 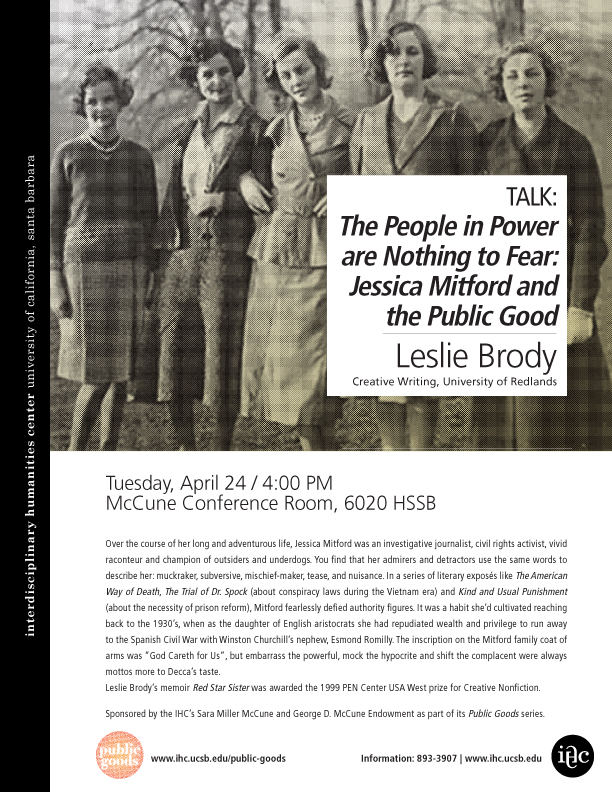 Click here to listen to a recording of Leslie Brody’s talk for the IHC’s Public Goods series. Sponsored by the IHC’s Sara Miller McCune and George D. McCune Endowment as part of its Public Goods series.